I would suggest this view contains some truth – communities do compete with each other for prestige, jobs, their tax base, and residents – but also ignores the larger reality of how cities and suburbs work in today’s world. The metropolitan region is a connected unit and the communities and agents work together. The differences between suburbs and city are ultimately smaller than the differences with other metropolitan regions. If Detroit’s core attracts new businesses and residents, this can only be good in the long run. If Detroit is only able to attract businesses and residents from the suburbs, this is not real growth – it simply shuffling actors around within the region. When both Detroit’s suburbs and core bring in people from other regions, they can grow together and the metropolitan region (and all the people within it can thrive). Of course, there are hurdles to coming to this perspective. Individual communities, city or suburbs, will not like if they lose assets and others around them gain. Racial and class differences lurk behind these current and historic differences. Money is tight. Ideally, suburban and urban leaders would come together to talk about how to proceed positively as a region. Going further, they could discuss how to share resources. (This is probably the toughest sell in American regions, particularly from wealthier communities who do not want to lose the resources they see as theirs.) But, working together for the greater Detroit area would pay off in the long run and help ensure a thriving region. Can you say you are from a city when you actually live in its suburbs? Perhaps this is even a bigger issue in Chicago where identification with a neighborhood or community area is very common among urban residents. While suburban residents shouldn’t try to boost their image by claiming to be from the big city when they aren’t, they are in a difficult place when talking to people from outside of the region. When meeting someone, telling them the name of your suburb can often produce blank stares. The Chicago region has hundreds of communities of varying sizes and it is difficult to expect people to know even most of them (even if they are from the region). The big city becomes a kind of shorthand of where you are from. One other option that might work could be to identify a noteworthy or large suburb that others may know – I’ve been surprised how many people register some familiarity when I say I live near Naperville. Additionally, there are certainly instances when saying you identify with the big city does make sense. Sports teams are the first example that comes to mind. There are very few American major sports franchises that identify with the suburbs. The only two that come to mind are the Long Island Islanders and the New Jersey Devils but they are from the largest region in the country and there are three hockey teams to differentiate. There are certain resources that big cities have that suburbanites could identify with, such as major airports (many people who have spent little time in the Chicago region can hold some kind of conversation about O’Hare Airport) or museums and cultural attractions. These numbers reveal dispersion since 2000. Then, the earlier suburbs had even more of the jobs, at 49.4 percent, 5.3 percentage points higher than in 2014. 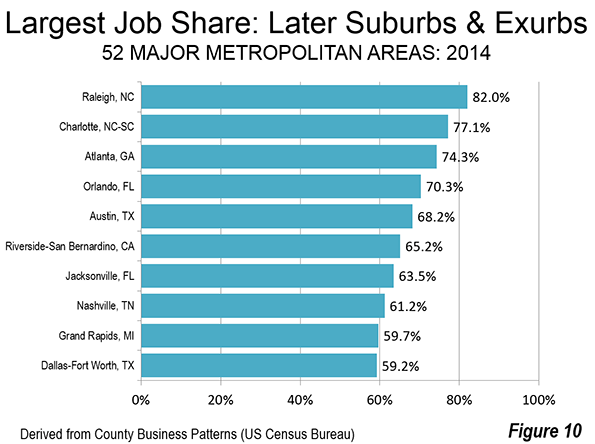 Virtually all of the lost share of jobs in the earlier suburbs was transferred to the later suburbs and exurbs, which combined grew from 31.4 percent in 2000 to 37.0 percent in 2014. 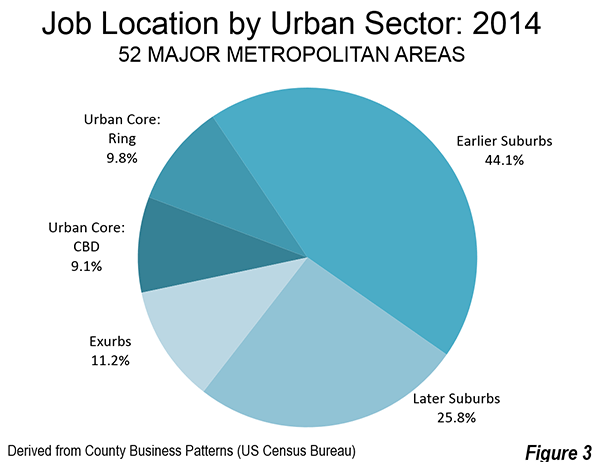 The urban cores had 19.4 percent of the jobs (8.8 percent in the CBDs), slightly more than the 18.9 percent in 2014. These figures counter claims or stereotypes that (1) suburbs are primarily bedroom communities where people sleep but work in the city and (2) urban cores are the primary job centers of metropolitan regions. Of course, some suburbs are bedroom suburbs and big city downtowns are still important, particularly for certain industries (think global finance). At the same time, it would be interesting to envision some of these Sun Belt cities with no downtown…how different would Raleigh or Atlanta or Orlando really be?